This is the latest CD (just released!!!! April 29, 2008) by composer and instrumentalist, Kevin Ferguson (See below for track details, audio samples, digitial downloads, ordering information, reviews, performance dates, how to get on the mailing list and sheet music transcriptions). Ferguson's latest CD release, "BALKAN & BEYOND/LIVE AT COSTELLO'S," is his first live album. Lara Triback plays hand percussion instruments. 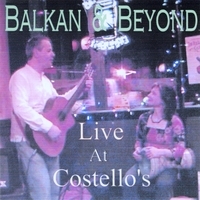 In this live album of Balkan, Near and Middle Eastern Dance music, some tunes are laced with improvisation while others are arrangements of the traditional melody in cases where dances match the melody. Sounds of dancers dancing and audience members clapping and singing to the music can be heard as well. Jorge and Willow of Underscore Orkestra can be heard singing the verses and along with the audience on the chorus. Jorge of Underscore Orkestra can be heard on harmonica. Order via Timbuktunes in Portland, Oregon. Available now at iTunes (http://phobos.apple.com/WebObjects/MZStore.woa/wa/viewAlbum?playListId=279919762 ). GroupieTunes.com has every track of nearly every album listed. CD 1: Violin music (Bach, Paganini, more) on electric guitar: STRAD TO STRAT, Kevin's first CD. CD 3: SUBTLE HINT: Progressive World, including electric & acoustic guitar arrangements of classical, world (Balkan, Hindustani classical rag, etc.) and original music. CD 5: Piano Concerto, Symphony & Sonata Just released (April 22, 2008)! All original classical genre compositions. CD 7: STRAD TO STRAT II: ELECTRIC VIVALDI (November, 2008) All original classical genre compositions.